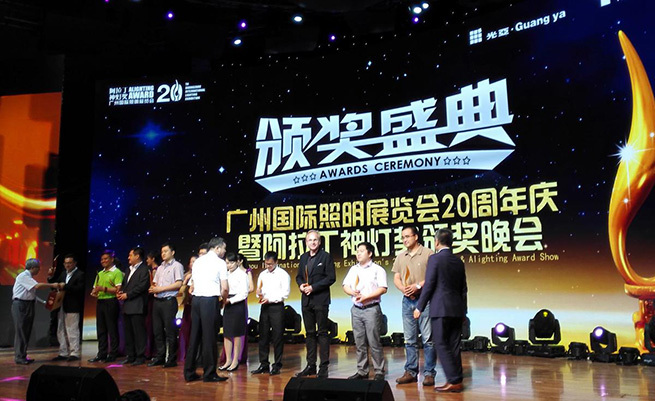 The Guangzhou International Lighting Fair 2015 – one of the world’s largest lighting exhibitions visited from across the world – celebrated its 20th anniversary in Xinghai Concert Hall in Guangzhou on June 9th 2015. LEDiL was awarded in Alighting’s Award ceremony in technology category of its developments in RZ-technology. Mixing of different colored LEDs is typically achieved with the use of mixing chamber i.e. white reflective chamber covered with diffusive translucent window. Mixing performance of the chambers is based on the random reflections happening inside the chamber. More reflections means better mixing of individual colors. Keeping in mind that in each reflection some light is lost, mixing chamber based designs typically have 15-25% losses on top of the optical losses. To address this lower efficiency LEDiL has invented a special way of color mixing based on the controlled refraction of rays instead of random reflections. In LEDiL’s patented RZ-mixing technology color mixing is done by altering individual rays on the surface of special sublens. RZ-technology is best suited for use with typical reflectors, leading into a very efficient mixing of colors. With RZ-lenses, typical losses are caused by Fresnel losses and are of magnitude 5-8%. In practice this means that a mixing chamber based design having a luminaire flux of 1000 lm can achieve over 1150 lm output if converted into LEDiL’s RZ technology. This performance increase can be achieved without increasing LED flux or driving LEDs harder. RZ-surfaces also smoothen out the light, providing a smooth and visually pleasant beam appearance. Color mixing reflector based mixing optics are less expensive than comparable TIR-lenses and perform well when used on arrays constructed of multiple LEDs. As of today, LEDiL’s full range of System Reflector families has dedicated RZ-sublenses available off the shelf. This includes hugely popular reflector sizes and families like 50 mm MIRELLA-family where each reflector version can be made color mixing by simply snapping MIRELLA-RZL lens in place. Other families that have color mixing RZ-sublens option are ANGELINA (82 mm) / ANGELETTE (110 mm) / ANGELA (120 mm) series and 70 mm BARBARA-PF reflector family. Each of the reflector families have a full range of beam angles available ranging from narrowest Spot distribution into Wide and even Extra Wide. LEDiL, with design expertise in Finland and production facilities in Europe and China, is leading optics supplier to the world’s premier lighting manufacturers. The innovative lenses and reflectors we produce provide optimal optic performance and durability. Relationships with top LED manufacturers allow LEDiL to release products alongside newest LEDs; our customers enjoy rapid development and deployment of new fixtures with latest technology. We are THE optics partner to ensure that your LED lighting fixture is the most efficient and innovative on the market. Our engineers possess a “can do, will do” attitude based on quality, innovation and collaboration. LEDiL has genuine desire to offer our clients competitive solutions and products and our staff consist of skillful and innovative experts that possess the latest knowledge of LED optics solutions.